How the ‘Hacker ethic’ almost killed the music industry, then helped save it, but might spell the end of ownership as we know it. In 2005, Sony went too far. In an attempt to control the illegal digital spread of music, they placed a ‘rootkit’ bug in all music CDs that automatically buried itself in a customer’s home computer on disc insertion. This bug, only hinted at in terms and conditions which presumed compliance, monitored and reported on the personal use of the purchased music files - a covert invasion of the privacy of anyone buying a CD from one of the music industry’s major players. As programmer Mark Russinovich - who uncovered the bugging strategy - pointed out: such techniques are more often affiliated with those looking to compromise a computer’s security. In the fog of desperation gripping an industry that could no longer see its own future, a global conglomerate turned hacker. Class action lawsuits were filed and Sony were forced to recall products and issue software to remove the bugs in what became a PR nightmare. For most the term ‘hacker’ is still commonly associated with similarly invasive tactics, but in certain circles the ‘hacker ethic’ means something very different. It is the “information liberalism” at the heart of our new digital world, an ideology of playful creation and dissemination through unbreakable networks. The freedom of information. And increasingly it’s political. The ‘hacker ethic’ can be traced through Western opposition movements such as Anonymous and Wikileaks - who use networking to empower and whose arsenal is information. For Dr James Allen-Robertson, sociologist and author of the new book Digital Culture Industry: A History of Digital Distribution, this ‘hacker ethic’ - forged when hippy counterculture overlapped with the budding computing industry in the sixties - is at the root of the modern media industry’s now dominant methodologies, from iTunes to Netflix. Ironically however, it may also change the nature of ownership forever - and not in the consumers’ favour, with purchasing effectively becoming “more like a long term loan”. “If the music industry had jumped on digital media straight away, they may well have been able to define the model of how we consume, a ‘subscription’ model, for example, such as Spotify. People would have probably gone along with it - the perception at the time was digital files were inferior and dispensable” says Allen-Robertson. 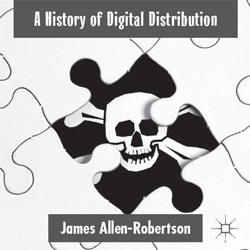 Allen-Robertson’s new book charts the rise of the pirates and their ideology, the “ethos of free cultural sharing”, and the media industry’s struggle to handle digital distribution. One of his conclusions is that perhaps the “killer app” for media in the digital age is simply convenience, ‘click of a button’ ease - which is how a computer company, Apple, has come to be the major gatekeeper for the music industry. Online piracy began in earnest with file-sharing forums in the mid-nineties, based on a perhaps naïve idealism. “There was a sense of ‘what’s the problem if I have a file and I copy it? It doesn’t cost anything or hurt anyone, and now this person has it and we both get to learn from it and enjoy it’, after all, information sharing was the point of the internet,” says Allen-Robertson. Piracy really got going with the Napster, a ‘peer to peer’ system with sophisticated distribution mechanisms. Demonised and eventually torpedoed by the industry, Napster embodied emergent approaches to digital distribution and caused a sea-change that we live with now - the MP3 as king, versatile and immediate. “The Pirate Bay is simply a website, one of many that act as a pick-up point, but the network itself is now completely without centre - no ‘in’ for government and industry to target for prosecution,” says Allen-Robertson. While the threat of prosecution may act as a deterrent for some, the pirates continue to adapt. Traffic is increasingly disguised, bounced around the world through different proxy services, with the individual behind the action hiding in the network. As Allen-Robertson points out, huge industries and governments have tried and failed to stop piracy networks, which “demonstrated these technologies have real power that can be utilised”. Indeed, the power of anonymity in the networked hive, as displayed by BitTorrent, is being increasingly embraced by political activism in the wake of economic meltdown. Social activist, or ‘hacktivist’, groups like Anonymous sprang from online networks based on notorious online messageboard 4chan. Whether it’s illegal Rihanna downloads, funny-looking cats or anti-capitalist riots, the ideology of the network, the ‘hacker ethic’ of unfettered dissemination, remains strong: “it’s difficult to fight against. It’s one thing to say ‘you can’t have our stuff for free’, quite another to say ‘your value system is wrong’,” says Allen-Robertson. The ‘hacker ethic’ stemmed from open source software programming communities in which developers freely collaborate and build on each other’s work, allowing for speed and innovation that would be impossible if every line of code was patented. The music industry, however, is based on an absolute copyright model, where every sale and radio play equates to income. While the corporate music industry fought in vain for control from the vantage point of rights holders and revenue stream, the programmers focused on accessibility of information from the perspective of the consumer. Technology became portable and affordable. In the same year Sony bugged its CDs, Apple launched the iPod shuffle - a small, relatively cheap way to get your musical fix on the go. Apple understood that people wanted the immediacy and access to information that piracy offered, and if you made it as easy as possible for people to obtain music - easier than the pirates - then they would pay for it. “Apple presented a complete solution for digital distribution at a time when the music industry was without direction. iTunes benefited greatly from both the accessibility ethos of the pirates and the state in which they’d left the music industry,” says Allen-Robertson. Subscription digital streaming is starting to do the same for film and TV, offering successful services such as Netflix that trump piracy in convenience stakes - but these services come at a price, and not just the 79p you paid for Dizzee Rascal’s ‘Bonkers’. “As the media industries have matured to take on piracy, pushing controls and legal statements into the background to ensure maximum convenience, troubling issues of ownership are starting to emerge,” says Allen-Robertson. Allen-Robertson cites the Orwellian example - both figuratively and literally - of a version of the classic novel 1984 that was being sold through Amazon’s Kindle store. In 2009 licensing issues around the specific version emerged, and Amazon wiped the book from the device of everyone who had purchased it overnight. For Allen-Robertson, such cases are an unnerving example of how the nature of ownership is changing, in direct conflict with the original ethos of the ‘hacker ethic’. The question of whether we have traded freedom for convenience remains to be seen perhaps, but, instead of just ticking the ‘I accept’ box next time, those terms and conditions might be worth a read. Digital Culture Industry: A History of Digital Distribution is available now, published by Palgrave MacMillan. Dr James Allen-Robertson is currently based at the Cambridge-INET Institute in the Faculty of Economics. He will be a taking up a Lectureship in Media and Communications at the University of Essex in September.